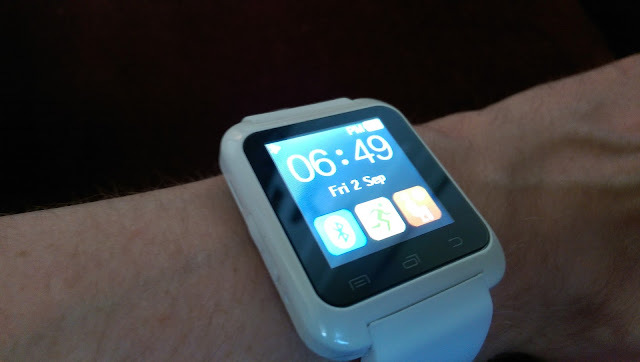 This is my thoughts on the 5ive U80 android-compatible smart watch. I've had the watch for a couple of weeks now and so I've got used to how it works, what's good and what's bad about it, so here's my review on it. After boot up it shows the main screen giving you time and date, along with some status icons along the top. These show bluetooth connectivity, received notifications and text message notifications along with battery state. The rubber strap is really comfortable to wear, I'm not a keen watch wearer but found this one sat on my wrist (Which is very skinny, so it fit great, on the second or third hole, so it's no problem for kids or skinny wristed adults like me!) comfortably. The screen is large but not too large to look ridiculous on my arm and the main button is unobtrusive and needs a proper click to engage so you won't be turning the screen on constantly by mistake. There isn't a motion/movement detector switch-on function on this watch. To connect the watch to your phone you need to use bluetooth, just pair it like any other accessory, which is pretty straight forward. It will display a random 4 digit pairing code on the screen, key this into your phone and accept it, it'll then pair up and connect (It will show you onscreen that it's connected and paired). That's the basic connectivity working. It will act as a handsfree speakerphone, display active call information and missed/last calls. It will also let you use the built in functions such as stepcounter, timer, activity monitor, etc. These are all pretty basic and simple to use. If you want to view text messages, get notifications for other events on your phone, etc, you need to install a specific application onto your phone that will push the notifications to your watch. I found the app which worked best was BTNOTIFICATION. Install it from the android market and then configure the "Notification app" section which lets you choose what applications on your phone can send notifications to your watch. It's basically allowing you to choose what notifications you normally see along the top bar of your phone on the watch, so choose which ones you want (along with system notifications too) and allow it to connect. I had to switch off and on bluetooth on the phone a couple of times for the watch to pair correctly and show all these functions. When it pairs correctly it will connect and show "connected" twice on the phone, kind of showing the basic connection, then the push notifications. On the phone you'll see the bt notification icon in the notification area along the top showing it's seen the watch and sending notifications. This then allows you on the watch to click menu (left button along the base of the watch) and choose either your messages for txt inbox, or the notifications menu to see other notifications (emails, etc, as per the applications you setup on your phone). The touchscreen on the watch is pretty responsive and swipes and multitouch seem to work accurately. I was impressed at such a low-price watch how clear the screen was and that it never seemed to lag or slow down in functions. The watch will show the call status throughout your phonecall and also show a hangup button to cancel the call, mute your microphone, etc. When somebody rings it will also show who is calling you and give you the option to answer or reject the call. I tried to disable the headset function of the device, by going into bluetooth settings on my phone, settings for the U80 bluetooth association and untick phone audio. The problem here is that with that unticked the notification app and sync between the two isn't established, so full notifications don't get sent to the watch. So effectively if you do this, it becomes useless, so you can't disable it! The three touch-screen fixed buttons on the homescreen aren't configurable, so you're stuck with the shortcuts of: Bluetooth settings, step counter and calorie tracker. 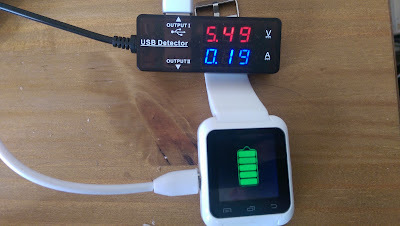 The battery life, initially appeared good, almost 2 days on my first try, but it seems to have dropped quite quickly. I'm now able to get 1 day out of it (fairly light use), but you must charge it overnight to have this, if you leave it powered off and not on charge it doesn't seem to retain charge and will drop out early. The battery indicator doesn't give you a clue either, it's either full, almost empty or empty and when it warns you the battery is low you probably have 10-15 minutes before power off completely. Charging it, I used my USB voltage and current monitor to see how much it pulls when charging (I used a 2amp capable charger) and it was very low, only 0.19 amps were pulled initially and after about 30 minutes this dropped quite quickly to only 0.02 amps, so a tiny trickle charge, so my suspicion is it's either got a very low capacity ni-mh battery in it, or it's charge circuitry isn't that smart. Overall, it's a nice enough watch, as a watch it works fine! 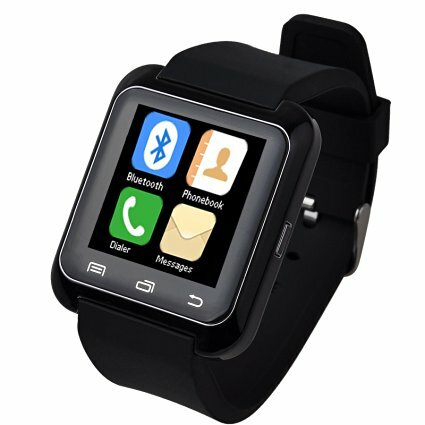 As a smart watch it does the basics OK, and will act as a speakerphone. Don't expect much more from it, and unless there is an update the fact it acts as speakerphone to all calls makes it my biggest negative for everyday use. Bus 002 Device 009: ID 0e8d:0002 MediaTek Inc. So you can see it registers as a usb serial device and also as a storage device. It initially registers as usb serial, disconnects and comes back as a storage device. I suspect this is the usb_modeswitch drivers for linux getting in the way so after disabling it still did the same. It appears as a serial device for a few seconds before the screen comes on with "Welcome" and it then switches to a storage device. The /dev/sdb cannot be accessed though and has no partition structure. I'm going to try and dump /dev/sdb to see if it contains the firmware or similar. When powering the watch up it prompts for "serial usb" on screen. Pressing this and it stays as a usb serial device that I can then access. Connecting to it using 9600,8,N,1 and I can get a prompt. I can send it an AT and it responds OK so it has some sort of AT command set registered with it. I couldn't get it to give me anything interesting, but there must be something in there! So if you have any ideas or further information, please leave a comment and I'll do a bit more investigation. Please note that I received in exchange for an honest and unbiased review for a discounted value. Honestly, I would have thought twice before buying this watch. It doesn't inspire confidence, sorry) Yes, and for the wider use of such a tracker will not be enough. It's better to resort to using source Uboro then it's guaranteed to control the driver's team that I need. And automatically carry out logistics and plan future transportation.